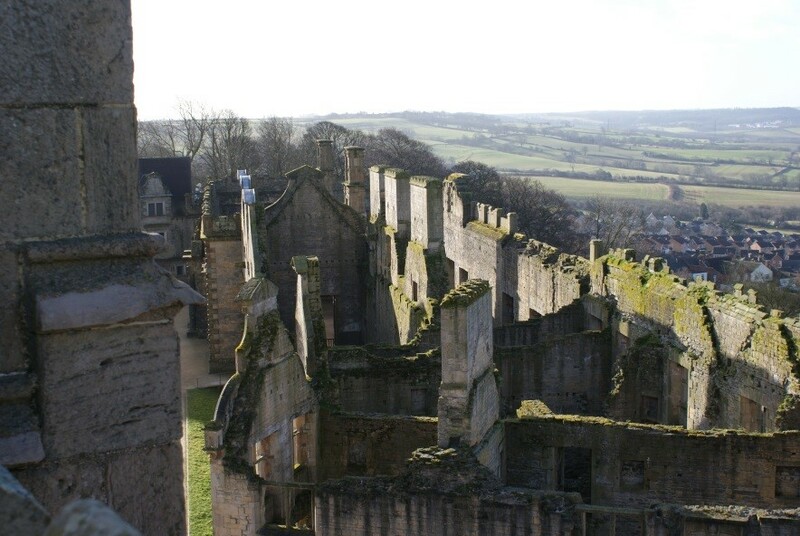 Bolsover Castle has a long and thrilling history. 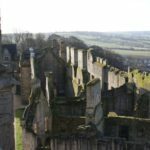 Originally established in the 12th century, it has stood witness to medieval political intrigue, been besieged during the reign of King John, before falling into disrepair in the 15th century. The Castle we see today is testament to the Cavendish family, the Dukes of Newcastle, and to both their vision, and political ambition. Charles Cavendish commissioned Robert Smythson to build a new castle on the site, with work continued and expanded under Charles’ son William, to include a riding school and Terrace Range. The Castle is a Scheduled ancient Monument, is Grade 1 Listed and is recognised as an internationally important structure. 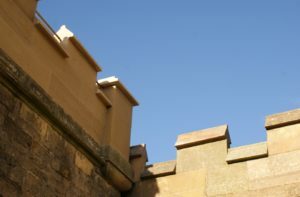 This project was commissioned by English Heritage to reinstate the Little Castle’s wall walk, doors to the balconies of the Little Castle and Garden Rooms, and replace modern plaster and paint finishes to the Little Castle with lath and lime plaster, finished in distemper. 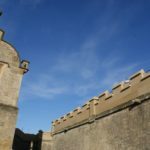 As a result of the project the Castle Walls will be completely accessible for the first time in many years, and the visitor will experience something closer to the vision of the Cavendish Family. 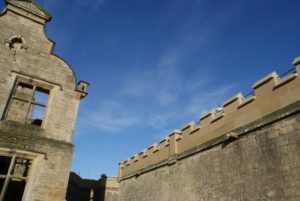 The project was managed by Robert Woodhead Limited’s specialist Heritage Team, Woodhead Heritage, who had previously managed two projects at Bolsover Castle, repairing the roof of the Little Castle and undertaking stone repairs. Bolsover castle is a unique complex of buildings consisting of The Riding House Range, The Little Castle and The Terrace Range. 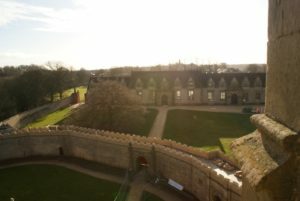 Bolsover Castle is a highly important visitor attraction in Derbyshire. The project has safeguarded and enhanced it’s future as a key tourism venue. The project is part of a wider scheme to regenerate the venue to increase visitor numbers and to improve the visitor experience. 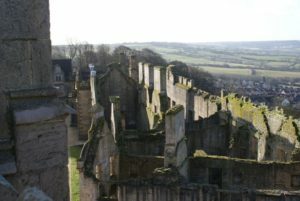 The wider English Heritage project has included the development of a play area, new exhibition and furnished interiors. The project will provide a lasting contribution to the Castle’s future. English Heritage will also be extending the existing volunteer scheme and have recruited a team of stewards and garden volunteers to assist with the room stewarding and upkeep/planting of the garden throughout the year. Before the project was commissioned it was not possible to walk around the perimeter of the walls, now the project is completed the wall walk gives visitors exceptional views across the Castle grounds into the gardens and lets visitors walk in the footsteps of history. 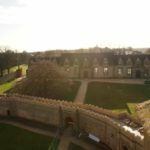 This project has not only improved the Bolsover Castle Estate it has transformed it’s tourism and visitor offering. 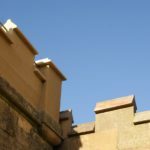 The improvement to go from inaccessible walls to accessible walls is remarkable and will secure the Castle for future generations. 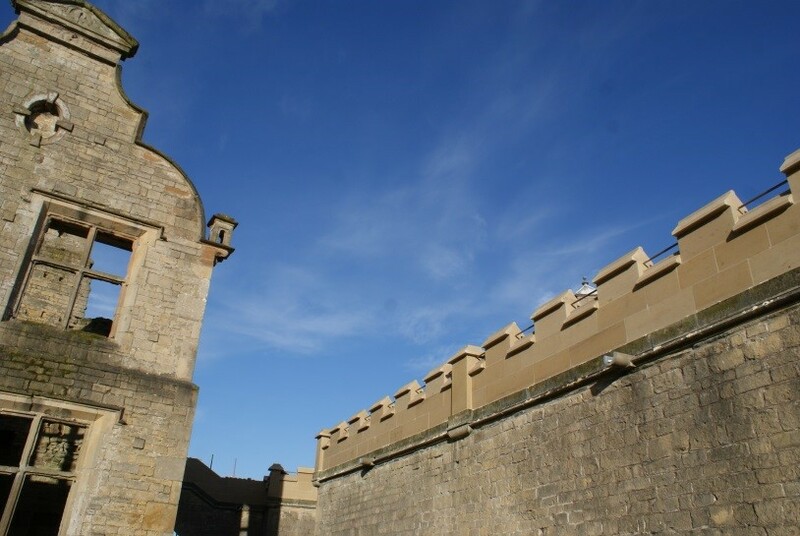 The works that Woodhead Heritage undertook included the reinstatement of historic crenellation to the wall walks, including newly designed and erected metal balustrades and handrails, which allow access around the walls to the Fountain Garden for the first time in many years. 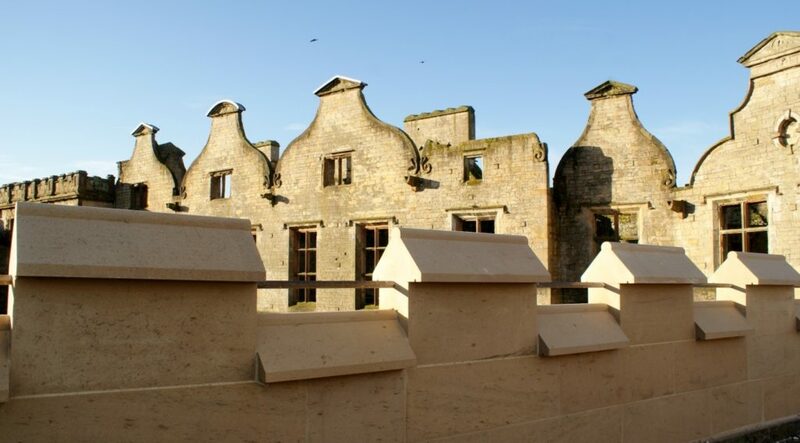 This included the installation of phosphor bronze bars between crenels to match up with the existing walls, which are approximately 400 years old. Capping and high level consolidation was undertaken to the Terrace Range as well as the provision of a 120m stone wall along Dukes Drive. Blocked up doors to the Little Castle’s Marble and Elysium Closets were re-opened, and fitted with oak doors, glazed with hand blown crown glass fitted with UV resistant film. Decorative ball finials were gilded in 24 carat gold on both balconies. Rooms were re-finished in lime plaster, and re-decorated using traditional distemper casein paint. The stone selected was from Dunhouse Quarry, the closest match to the Mansfield White which has long been out of production. The stone was chosen to help integrate with existing sections of the wall. Traditional Skills were kept alive on the project, using skills such as doweling and pinning to anchor the new hand crafted finials in place. There were 67 new finials crafted in total and 102 moulded pedestal coping stones. All stones were hand lifted into place on the walls. Traditional lime mortars were used throughout and mixed with sharp sand to match with existing. We employed local craftsmen, a team of 7 masons worked on the project lead by Phillip Turton of P Turton Building and Conservation Limited. The masons were sourced as locally as possible. One lived just 200 yards away from the site. Due to this we were able to offer the client much more flexibility during work. This project was very personal for the head mason. He had previously worked on the Castle some 20 years prior to the recent development commencing. Having a personal tie and passion for the project inspired true quality and compassion for the Castle. Hofton Joinery was appointed to replicate four historical door-sets using original materials and methods. Ensuring historical detail to the Marble Closet, Elysium, Garden room and Garden side room. Bespoke ironmongery was commissioned to replicate hand forged techniques. Our subcontractors technical manager worked with a heritage glazier to agree moulding detail to support the glass with ferramenta bars. The design was agreed to ensure the diamond and rectangular leaded lights were of equal size and the ferramenta bars placed in the exact position. The balconies of the Elysium and Marble Closets are two of the oldest surviving balconies in the country. The apertures were changed from later windows to what is believed the style of earlier glazed doors. Once the later walls had been removed historical hinge pins and stone thresholds from the original doors were exposed which couldn’t be removed. This made the installation of the new door frame difficult because the pins are housed into the frame. 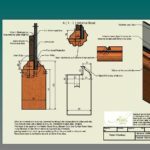 The door set was originally designed to open outwards, but on inspection a keystone was discovered. The design was changed to enable the doors to open inwards. The doors were designed and constructed using traditional techniques with full mortise and tenons, wedges and dowels. An existing historic door was repaired; with tenons and panels repaired or replaced as appropriate. Additional internal redecoration was undertaken to the spiral staircase within the Little Castle using a specially sourced handmade paint. The walls were dusted and cleaned before painting. Some of the existing masonry had original finishes and was historically important, therefore; these panels were left exposed. In the 18th century, lead was stripped from the roof of the Terrace Range at Bolsover Castle to affect the necessary repairs to another property. High level consolidation and capping to the Terrace Range was undertaken by Woodhead Heritage to prevent the Terrace Range degrading any further. The castle was open to the public over weekends and the Castle hosted numerous school visits during the construction period. Additional safeguarding was put in place to protect the public. Continuous cleaning regimes and regular inspections of all site hoarding and site signage were put in place to maintain a safe, tidy site, particularly ahead of weekends when the castle was open to the public.